The Julian Basilica is located at the east end of the Roman forum and apparently served as both the entry to, and the eastern terminus of, the forum. A two-story structure, with a main peristyle hall above a four aisled cryptoporticus, the basilica was first built during the first decade of the first century A.D., entirely of local poros limestone and stucco. 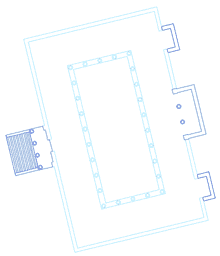 Designed on a module of 10 Roman feet (RF), it is a simple plan of a rectangle within a rectangle; the outer walls were 130 RF by 80 RF (38.44 x 23.55 m) and the inner peristyle was 90 RF by 40 RF (26.70 X 11.75 m) Within the main hall the height from the floor to the ceiling was ca. 10.37 m.
From the start, statues of members of the imperial household were displayed within the building, including those of Augustus and his grandsons Gaius and Lucius, as well as dedications to other members of the Julio-Claudian family. At some time during the second to third quarter of the first century, the interior of the basilica was partially reveted in marble. This was done most likely before the earthquake of the 70s A.D. Some of this revetment, including the inscription citing the addition of the revetment, was reused as building material during Antonine renovations. The earthquake does not seem to have caused serious structural damage to the building although there is some evidence that the main floor was shored up from below. During the reign of Antoninus Pius the Julian Basilica underwent significant renovations including the vaulting of the south aisle of the cryptoporticus, rebuilding of the porches, reveting the interior in various marbles, and incorporating many marble architectonic elements both on the exterior and interior. The basilica remained in this grand form until it was toppled by the severe earthquake which struck Corinth in the later fourth century A.D. After this event, the remains of the Julian Basilica became spolia and were reused as building material for other structures. Building summary written by Dr. Paul D. Scotton. 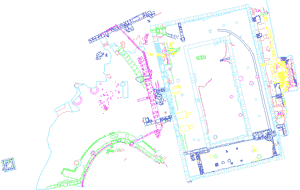 Figure 2: Actual State of the Julian Basilica and the eastern end of the Forum. Paul D. Scotton, The Julian Basilica at Corinth: An Architectural Investigation, dissertation in Art and Archaeology of the Mediterranean World, University of Pennsylvania, 1997. Saul S.Weinberg, Corinth I, v, Results of Excavations conducted by the American School of Classical Studies at Athens, The Southeast Building, The Twin Basilicas, The Mosaic House, American School of Classical Studies at Athens, Princeton, 1960.